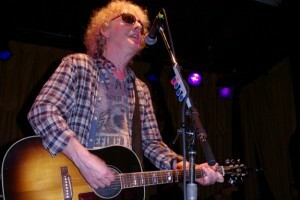 So, 25 years to the day after first seeing/meeting Ian Hunter, our anniversary of that epic event couldn’t of been any more perfect. A line stretched around the Beachland in Cleveland, Ohio as many folks buzzed about hoping to obtain a ticket, some lucked out, others we hear, did not. One thing is for certain, Hunter brings out the old school who rarely leave their house, except for when he’s in town. Reminiscing with old friends (some traveled for miles) is half the fun of seeing Hunter in Cleveland and his fans are beyond loyal so it’s something we’ve come to expect but we never take for granted. Hunter’s fans are the best. Some nice video footage has surfaced which we’ve obtained permission to upload here, so return soon to see some live action from this memorable night in Cleveland. Meanwhile you can read my full account of the concert here and please bare with us while we correct the glitches in the weirdandgilly.com photo gallery. Going forward, we hope to blog more often and share with you some fantastic photos; some new and some from the archives. Typical WaG, slow but sure. Lastly, we’re thrilled to report that Hunter will return to the studio on Jan. 9, 2012 and we look forward to the new “rocking” record. More on that and ‘The Ballad Of Mott The Hoople’ documentary will soon follow. Until then, we’ll go on record to say that this show at the Beachland with the Rant band was one of the best performances we’ve seen from Hunter in years. Anything but just another night.